Edwin Walter “Ed” Overton, 65, husband of Joyce Ann (Washburn) Overton, of 1169 Estaline Valley Road, Craigsville passed away Thursday, April 11, 2019 at his residence. Mr. Overton was born on August 25, 1953 in Richmond, Virginia, a son of the late George Arthur, Jr. and Charlotte (Ralston) Overton. 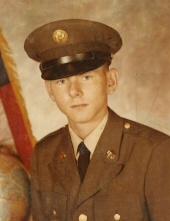 Ed was a veteran of the United States Army serving during the Vietnam War. He enjoyed hunting, fishing, woodworking, and making fishing lures. In addition to his parents he was preceded in death by a son, Steven W. Overton; a brother, Clyde Lane; a sister, Patty Layne; and a grandson, David Overton. In addition to his wife of 46 years, Ed is survived by a daughter, Christina Lynn Kellington of Staunton; a brother, Jack Layne of Ashland; four sisters, Edith Knowles and Christine Simmons, both of Ruther Glen, Helen McDonald of Louisa, and Mary Tompkins of Bumpass; three grandchildren, SPC Dakota Smith, Dale Smith, and Conley Overton; and a number of nieces and nephews. A Celebration of life will be conducted 11:00 a.m. Monday, April 15, 2019 in the Coffman Funeral Home Chapel by Pastor Billy Curry. To send flowers or a remembrance gift to the family of Edwin Walter "Ed" Overton, please visit our Tribute Store. "Email Address" would like to share the life celebration of Edwin Walter "Ed" Overton. Click on the "link" to go to share a favorite memory or leave a condolence message for the family.